Getting rid of psychological stress isn’t difficult. Don’t believe us? Just take a 20-minute stroll in nature and see what a difference it makes. Psychological stress is a part of everybody’s life these days because of problems related to work, home, relationships, finance, environment and other aspects of life. When cortisol or the stress hormone in your body shoots up, it affects not just your mood, but your health as well. While we cannot wish away the problems, what we can do is learn how to effectively deal with them while keeping our health, body, and mind intact. Getting rid of stress isn’t a complicated process. Even the simplest of things can give us relief. 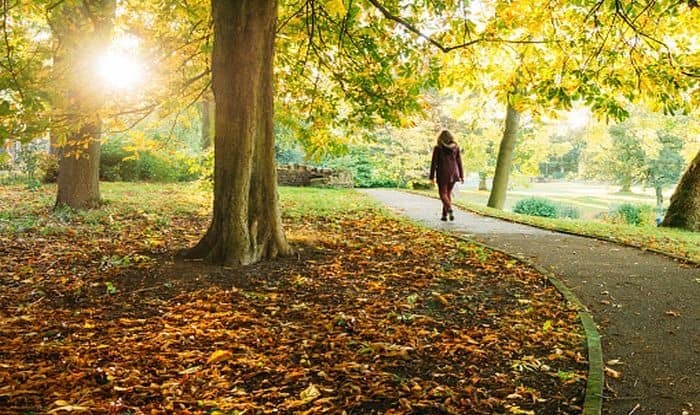 A new study by the University of Michigan says that taking just 20 minutes out of your day to stroll or sit near nature will significantly lower your cortisol or stress hormone levels. Have fish oil: You could also have fish or fish oil daily to fight stress. Fish is full of omega 3 fatty acids which have been proven to reduce stress symptoms and basal cortisol secretion. Listening to music: Listening to music, especially classical music by western classical music composers Mozart and Strauss, has been scientifically proven to lower blood pressure, heart rate lower and cortisol concentrations. Clearing clutter: Is your desk too cluttered? You need to start clearing it out right away not just to make it look clean but also reduce stress at work. Studies have shown that clearing out your clutter can give you more clarity and space. Cluttered spaces have a tendency to affect your productivity by fogging your brain. Smiling: Did you know that just breaking into a smile can help relieve stress? A 2015 study observed how smiling could make your heart rate slower, bring your blood pressure down and reduce stress. Even if you don’t feel like it, just force a smile and you’ll immediately feel better. Singing: The next time you feel stressed, just break into a song or hum a melody. Group singing, especially, can help release feel-good hormones called endorphins which will instantly make you happy.